The debut of Android hasn’t been kind to RIM. In the last year, BlackBerry has plummeted from dominance to irrelevancy on carriers in the United States and things don’t appear to be turning around with BlackBerry 6.0. 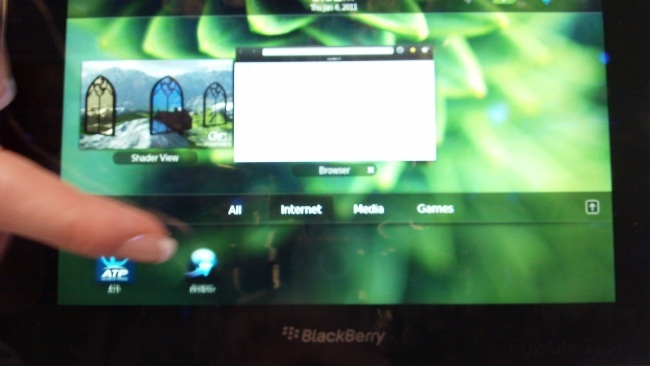 Fortunately, RIM has a pretty good trick up its sleeve: BlackBerry Tablet OS (based on QNX, a platform RIM acquired). I had a chance to sit down with the BlackBerry PlayBook tablet on the show floor of CES, and the experience was somewhat surprising. The first thing I noticed about the BlackBerry PlayBook is its size, which is a scant 5.1 x 7.6 inches. It’s hard to compare the 7-inch wide screen to the iPad at all. Much like the Samsung Galaxy Tab, it’s tiny. It’s also a great tablet. For the first time in a good long while, RIM has gone their own way and pushed the envelope with a different approach to the tablet. The design of the OS is very reminiscent of Palm’s underrated Web OS. Open applications can be windowed and flicked through like a photo album and even tossed up (and away) much like Palm’s OS. Hopefully BlackBerry Tablet OS will last a little longer than Palm’s ill-supported smartphone operating system. 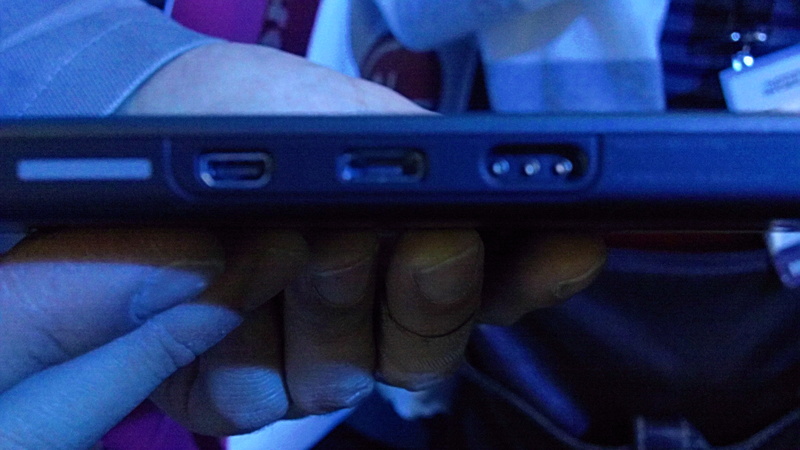 Unlike Android or iOS, there are no buttons on the front of the PlayBook. Instead, to do most things on the device, you swipe your finger from the black border area onto the screen. This technique allows you to swipe from different sides of the screen to bring down invisible top menus, multitask between applications, and easily minimize apps. It’s surprisingly intuitive compared with the clunky ways Android and iOS tablets handle multitasking, though I didn’t get a chance to see how notifications arrive and display themselves. Gestures are great, but they’re only good if the computer behind them is fast enough to match. Luckily, RIM has embedded a dual 1 GHz processor and a full gigabyte of RAM in the PlayBook, making it one of the snappiest tablets at CES this year. The tablet had no problem running a demoed Flash game of Quake III Arena, several movies, a multi-tabbed browser, music, and pictures at the same time. The only slow portion of the demo was the Web itself, which can hardly be blamed on RIM, as the Internet is notoriously slow at CES due to the 125,000 other attendees trying to access it. I’d dare say the PlayBook runs a lot slicker than most Android-based tablets and certainly could sit on a shelf next to the iPad without feeling embarrassed. If RIM decides to make a 10-inch version of the PlayBook, Apple may have something to worry about. Other features include 4G Internet access (if you buy it through Sprint), Wi-Fi, a 1024×600 screen, a 3MP front-facing camera and 5MP rear camera that both take 1080p HD video, Adobe Flash 10.1 for unimpeded browsing, HTML 5 support, syncing software to link up to a BlackBerry mail account, a mini HDMI port, Micro USB, media buttons on the top, a magnetic charger, and 16-64GB of storage. It weighs a little under 1 lb (400 grams). RIM seems to have learned some valuable lessons in the last year. All of its devices are much snappier and feature its stopgap BlackBerry 6.0 OS. In addition, RIM seems to finally value apps. Thanks to a renewed emphasis on apps and the waving of development fees, representatives told us that the App World market grew from 5,000 apps at the beginning of 2010 to about 17,000 now. RIM’s executives may not be happy about this, but we sure are. I initially wrote off BlackBerry, but the PlayBook shows the company has some creativity left in it. RIM has been touting the PlayBook as a great business device, but it may prove more popular on the consumer market. Still, like most 7-inch tablets, it feels too small. Hopefully a larger 10-inch version is on the company’s radar. The BlackBerry PlayBook does not have an official price or release date, but representatives say it will hit shelves in the first few months of 2011.